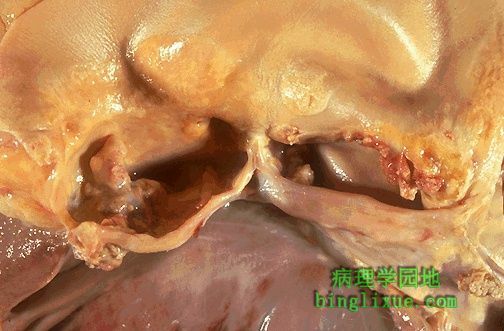 Here is a congenital bicuspid aortic valve. Most bicuspid valves are prone to calcification. Patients can remain relatively asymptomatic until the stenosis reaches a critical point when congestive heart failure rapidly ensues. The dense white nodules of calcification are present on either valve surface. The valve here has been opened with the aortic outflow above and the left ventricular myocardium below.